Rep. Alexandria Ocasio-Cortez (D-N.Y.) is getting under conservatives' skin so much that right-wing actor James Woods has labeled her "the most dangerous person in America." "It is not normal to hold 800,000 workers' paychecks hostage. It is not normal to shut down the government when we don't get what we want," she said in her first address to House members. Fox News mocked the congresswoman on Thursday with a false claim that Ocasio-Cortez couldn't manage to find Senate Majority Leader Mitch McConnell's (R-Ky.) office when she and other representatives attempted to present him with a letter urging him to end the government shutdown. But the group had already stopped at McConnell's office, she said. Ocasio-Cortez snapped back, as she usually does, asking: "At what point is Fox News obligated to not lie?" The attacks from the right continue as the congresswoman's proposal seeking increased taxes on the super-rich may be gaining traction. 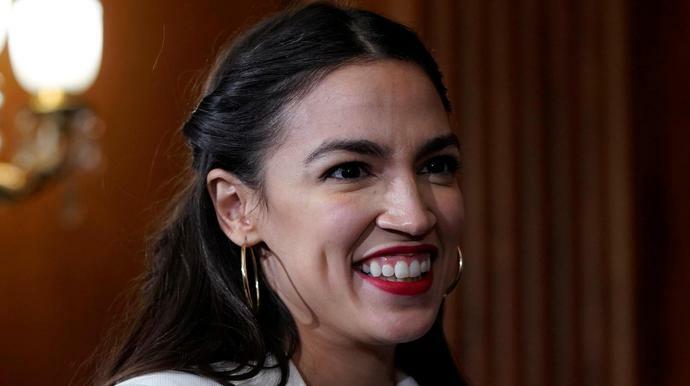 Ocasio-Cortez has floated a proposal to impose a 70 percent marginal tax on earnings that exceed $10 million a year. The first 10 million of an individual's annual income would not be taxed at 70 percent. A similar marginal tax rate was imposed in the U.S. for 35 years after World War II. A new poll has found that more Americans support the idea than oppose it. A survey by Business Insider found that 38.7 percent supported such a tax rate, while 34.4 percent opposed it. Another 13.5 percent said they didn't have an opinion. A Reuters poll in October found that 76 percent of Americans "strongly agree" or "somewhat agree" that the wealthiest Americans should pay higher tax rates. Once again this twit from New York has it wrong. It is not Trump holding up progress. It's the pelousey puppets who refuse to even meet. They won't budge and that's a wonderful thing to libs. Trump won't budge and to the libs that's terrible. Trump promised a wall, many of the talking heads wanted a wall at one time and now that it is time to put up or shut up the need for a wall doesn't matter. They can't put out 5-6 billion dollars for the wall yet they will pay out 100s of billions on the illegals medical, educational and welfare benefits. Plan #1 defund and evict the Anti-America UN from American soil and use that money to fund the wall. Eliminate the money going to planned Parenthood and the wall gets bigger. The money is there, it's just going the wrong direction.